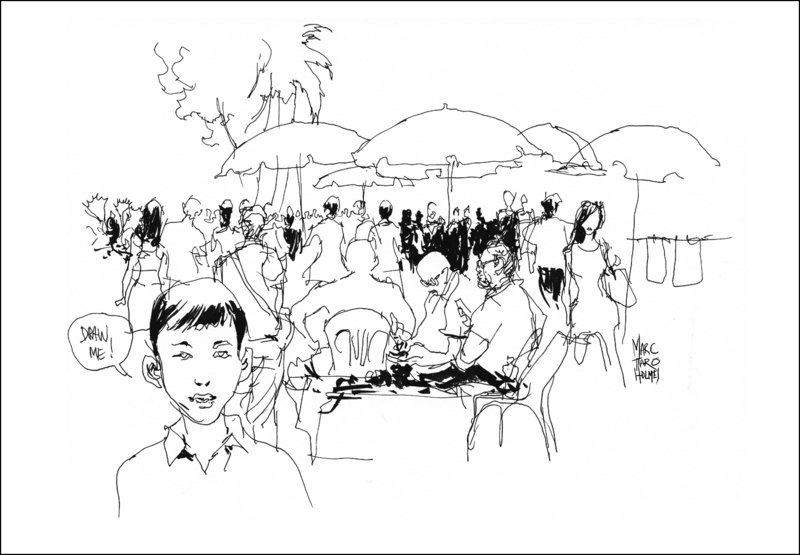 We’re recently back from the USK symposium in Singapore. 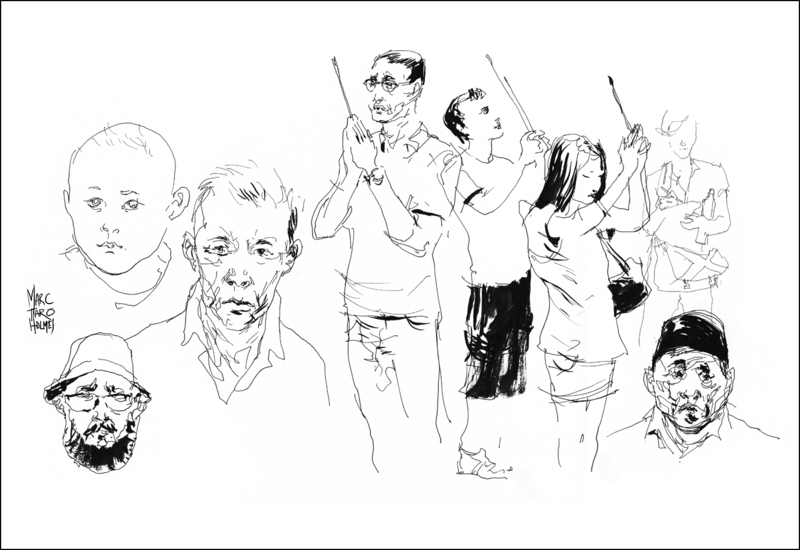 Gathering together with artists from all over the world for a massive festival of drawing. To be able to draw from sunup to sundown with other obsessive sketchers. When I look back on it, it’s astonishing that this outrageously fun event is made possible every year by everyone’s combined efforts. The behind-the-scenes planning of the symposium committee, the support of the sketchers who come, the hard working local volunteers, and the goodwill of instructors coming from all corners of the earth. This year my small contribution to the program was a workshop on Street Portraits. In my personal work recently, I’m doing a lot of plein air painting – but back a year ago, when planning for Singapore, I was launching my Craftsy.com course on sketching people, so this was foremost on my mind. I was surprised to see, when designing the class that in even the short time since launching my online course, I’ve already improved tweaked my process for drawing people. I have been trying to keep up with self-training. My hundred person challenge for instance, or the occasional afternoon out sketching at a pub. But I have not really been going to life drawing in a serious way. The last time was back in January. There just hasn’t been time with all the travel we’ve been up to :) (First world problems hey?). So, imagine my surprise, when I go back to street portraits – suddenly I have a lot of new ideas that come from my travel sketching. Sketching landscapes, has made my people drawing better! Who knew? Ha. The shortest explanation of the new approach would be: Go directly to ink without a pencil gesture > Greater emphasis on Silhouette Shape > Less concern with inking black shadows – as I know that the watercolor will handle the values. I admit – there is always going to be a high failure rate with direct-to-ink sketches from life. But it’s just paper at stake. I’m totally OK with flipping the page and sketching another one. (This is why I like loose paper vs. bound books). I drew the shoemaker on the far left (above) six or seven times over the course of the three day workshop. (His portable workbench was right next to my teaching spot). Gradually you can get a subject’s routine down – seeing the ‘working pose’ between reaching for tools, tamping his pipe, and selecting another shoe to work on. In the end, despite many false starts, I have this fresh, lively drawing, that I couldn’t have gotten any other way. (Here’s an old post that illustrates this perfectly). The faces on the left here are good examples of my current theory “head-shape/hair shape”. (See class notes). I’ve chosen to teach this direct-to-ink approach even to beginners, because A: it’s much faster this way and B: it makes a more spontaneous drawing. 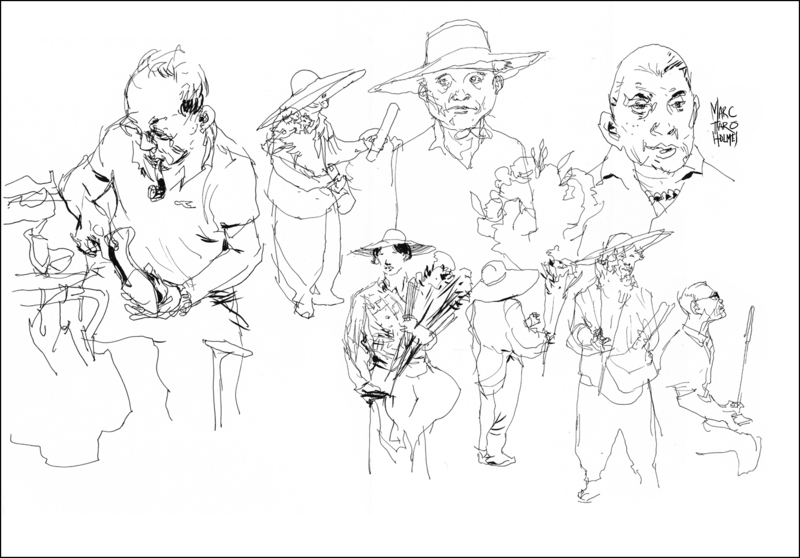 I now think that any added difficulty students might have at first (when going straight to ink (or watercolor)) – will be overcome by a few weeks practice – and will pay back 100 fold in more responsive, honest, direct observational drawings. This doesn’t mean I never-ever use a pencil-gestures-and-inking-over approach. Just that I always say – you can only teach what you do. So I have to show what’s on my mind right now. Even if it changes year to year. Anyway – this is a complex question – and I’m sure I’ll be mulling over the value of pencil guides vs. direct ink drawings more than a few more times this year. I hope you’ll check out my class notes from the workshop. There are a few good tips for portraits, and a good trick for drawing crowd scenes to back up your stars. You can get the free PDF below (click the image) or from my download page over here. As well – in celebration of the launch of my new Craftsy.com class on Travel Sketching in Mixed Media – I’m also putting my original Sketching People in Motion class on sale – $15 off – for any readers of this blog. (Click over here to register). Marc I’ll second your comments on how great the Singapore symposium was and also how much your class helped me with my people drawings. There has been a noticeable decrease in the number of ‘axe murderers’ and ‘Groucho Marx’ noses in my sketchbook since I took your class. I like working directly with ink and my faces now look like individuals. Who’d a thought it! Can’t wait to get to another symposium. Good times. Great post. I enjoy your blog and I’m looking forward to the next Craftsy class. Can’t wait for your next Craftsy class! And I soo appreciate your generosity in not only sharing your class notes this way, but the process of your own evolution and how that translates into teaching. I’m constantly trying out your new ideas and will eventually find my way to one of your in-person workshops. Way to go Marc!